thebahamasweekly.com - Broker James Sarles showcasing Grand Bahama on HGTV on Feb 11th. 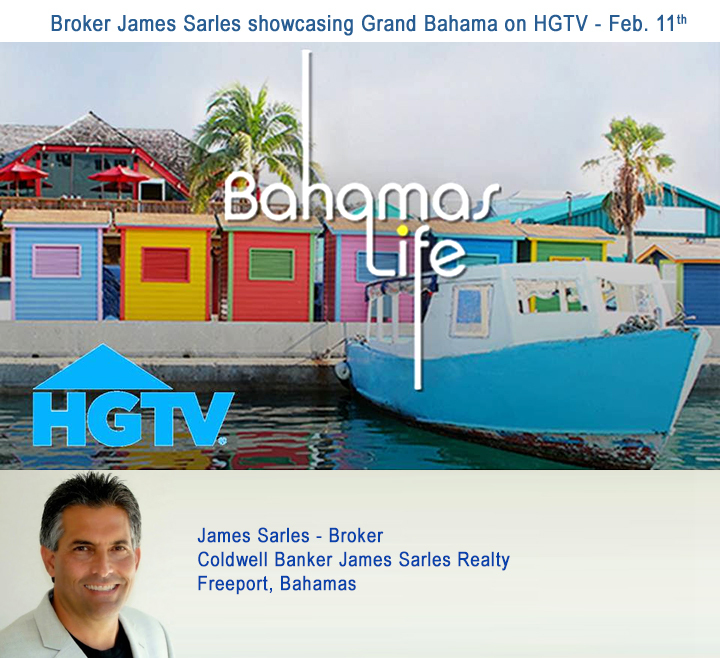 Broker James Sarles showcasing Grand Bahama on HGTV on Feb 11th. Freeport, Grand Bahama Island - When Bahamas Life conducted the casting call for their new HGTV series highlighting real estate opportunities in The Bahamas, broker James Sarles of Coldwell Banker James Sarles Realty was chosen to showcase what Grand Bahama Island has to offer. A Canadian couple is ready to put the hectic pace of Montreal behind them by unwinding in an island home. After experiencing the sun, sand and direct access to the open ocean, these avid boaters fell in love with Grand Bahama and now want to make the island their permanent home. It's now up to their realtor, James Sarles, to help find them the perfect home that accommodates their nautical lifestyle. Bahamas Life Grand Bahama airs this Sunday, February 11 at 9:30 pm on HGTV. TheBahamasWeekly.com worked closely with the team at Bahamas Life to execute the nationwide search for agents fitting the show's story-line. Coldwell Banker James Sarles Realty is a market leader specializing in Grand Bahama commercial and residential real estate. One of the most trusted real estate firms in The Bahamas, their excellent reputation is built on the scores of satisfied customers we've been privileged to assist in making these beautiful islands a second home. Coldwell Banker James Sarles Realty has unrivalled luxury property listings, tremendous local knowledge and experience, which makes buying or selling property a pleasure. A member of Bahamas MLS, with more than 600 licensed realtors as members, property on their network will be exposed to a huge number of potential buyers, making the process of finding the ideal buyer faster and easier than with other agents. Sarles Realty was founded by James Sarles in 2003, and became a Coldwell Banker franchise in 2006 as part of the island affiliates network, providing state-of-the-art marketing and networking tools to expose our their property listings to the widest possible audience of potential buyers a distinct advantage over other real estate firms.